Squeezed in among storage boxes, another lorry load of migrants sneak into Britain. It is believed that the lorry arrived in the United Kingdom from Belgium. The 11 stowaways – three of them children – were intercepted by police in east London yesterday. Asked where they were from, they replied: 'Iraq' and 'Kuwait'. The dramatic pictures emerged as the Tories were accused of being in referendum chaos over border controls. George Osborne insisted there would be no change to European Union rules on freedom of movement. In common with other newspapers, an earlier version of this agency story said that stowaways intercepted in east London had told police that they were ‘from Europe’. In fact, while they had travelled to the UK from mainland Europe, the migrants told police they were from Iraq and Kuwait. Bookmakers shortened the odds on a 2017 general election to 2/1. 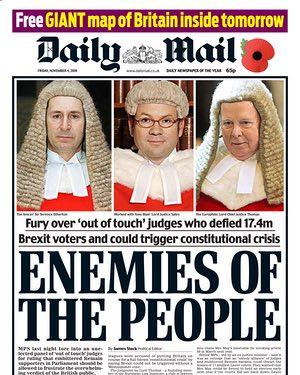 The row exploded yesterday morning when a panel led by the Lord Chief Justice, Lord Thomas, ruled that Mrs May cannot trigger Article 50 – the formal two-year process for leaving the EU – without a vote by Parliament. This is despite a clear commitment by the Government during the referendum to enact the public's verdict without delay. A furious Number Ten vowed to challenge the 'disappointing' decision in the Supreme Court next month. The judge who has threw a spanner in the works yesterday is, professionally at least, a committed Europhile. Lord Chief Justice John Thomas was a founder of the European Law Institute, a club of lawyers and academics aiming to ‘improve’ EU law. He was also president of the European Network of Councils for the Judiciary for two years. Master of the Rolls Sir Terence Etherton is no stranger to the cut and thrust of politics. He qualified for the 1980 Moscow Olympics as part of the British fencing team – but boycotted the games in protest against the USSR’s invasion of Afghanistan. The 65-year-old, who took his role as the second most senior judge last month, made legal history a decade ago as the first openly gay judge to be made a Lord Justice of Appeal. Asked about the man screaming 'Allahu Akbar', the officer told La Region he had heard him say something in Euskara - the language of the Basque region - but didn't understand it. An earlier version of this story reported claims that the gunman shouted "Allahu Akbar" as he opened fire, which turned out to be incorrectly reported by a Spanish newspaper. We have amended the story and apologise for the error.